On the afternoon of May 6, 2010 the Dow Jones Industrial Average suffered its biggest, fastest decline ever, and hundreds of stocks momentarily lost nearly all their value. So many things went wrong, so quickly, that regulators haven't yet pieced together precisely what happened. A close examination of the market's rapid-fire unraveling reveals some new details about what unfolded: Stock-price data from the New York Stock Exchange's electronic-trading arm, Arca, were so slow that at least three other exchanges simply cut it off from trading. Pricing information became so erratic that at one point shares of Apple Inc. traded at nearly $100,000 apiece. And computer-driven trading models used by many big investors, apparently responding to the same market signals, rushed for the exits at the same time. Three months later, many market veterans have arrived at a disquieting conclusion: A flash crash could happen again because today's computer-driven stock market is much more fragile than many believed. Many investors, still gun-shy, have been pulling money out of stocks. 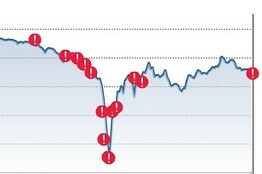 Track the Dow Jones Industrial Average throughout the day and see how several market components went haywire. "The whole system failed," says John Bogle, founder of fund company Vanguard Group. "In an era of intense technology, bad things can happen so rapidly. Technology can accelerate things to the point that we lose control." May 6 exposed frailties in U.S. markets that hadn't been seen before. The SEC and Commodities Futures Trading Commission expect to issue a final report on the flash crash within a few months. Regulators have moved to fix some problems revealed that day. New circuit breakers, now in pilot mode, require a five-minute trading halt on S&P 500 stocks that move more than 10% within five minutes. These "collars" could help keep prices from suddenly cascading. But some forces behind the flash crash seem beyond the reach of regulators. Exchanges are unlikely to be able to prevent high-frequency trading firms or statistical-arbitrage firms from bailing out of the market en masse. The challenge for regulators and exchange operators is whether they can find ways to protect investors in a market ever-more defined by high-speed trading. It may be that such a market is inherently vulnerable to high-speed crashes.